One of the things that intimidates people the most about homeschooling high school is how to make homeschool transcripts. Thankfully, the solution is much easier than homeschoolers expect it to be, and it’s free—you don’t need a homeschool transcript service or expensive record-keeping software in order to create a homeschool transcript to send to colleges. If you are intimidated by the whole college admissions process, before reading about creating homeschool transcripts you might want to read Jeanne’s article about college admission requirements for homeschoolers. We often receive questions about homeschool diplomas, but it’s important to understand that when colleges ask for student records, they are asking for high school transcripts—the student’s official academic record. There are several ways to produce homeschool transcripts for your student, including availability from various organizations, online planner services, or creating your own. 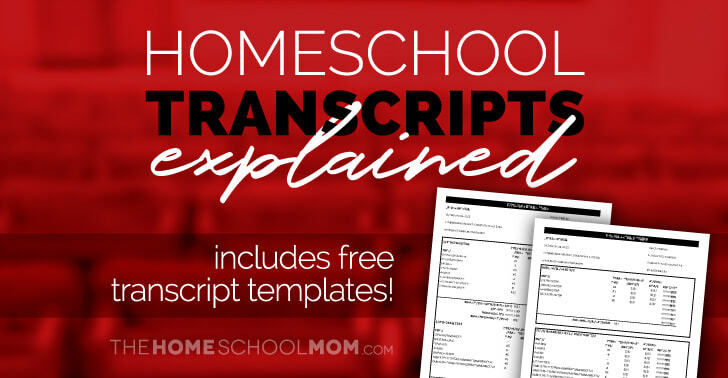 We have made it easy to print your own transcripts with our free homeschool transcript template for Excel—just input the information, set the print area, and print the spreadsheet. You’ll find the link at the bottom of this page. What is the best way to keep track of records/grades for high school? 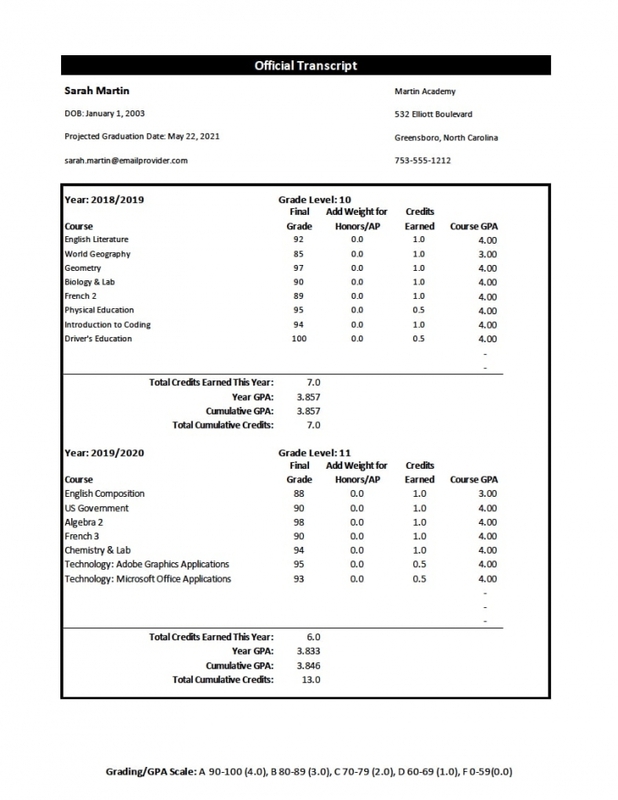 What goes on a homeschool high school transcript? How many high school credits are needed to graduate? 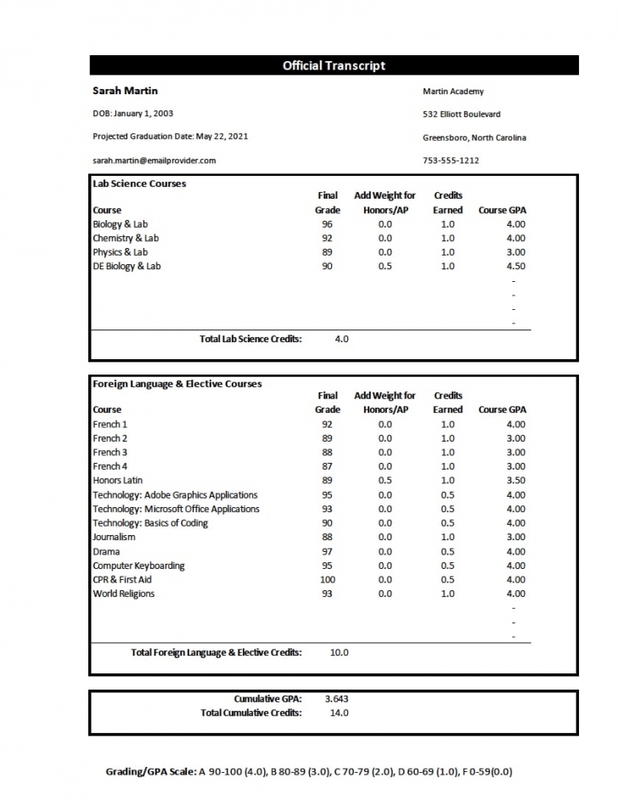 Which courses should be included on a homeschool transcript? Do courses have to be accredited/do the transcripts have to come from an accredited institution? If we covered AP material, can I could the course as an AP course? Is there a special format and/or contents needed for homeschool transcripts sent to colleges? Homeschoolers have many experiences and activities that they want admissions officers to notice, but care should be taken to promote those in the appropriate manner. This may or may not be on a homeschool high school transcript. As the student’s official academic record, a high school transcript is shared with colleges and universities to show the student’s academic readiness to do work at the college level. While homeschoolers often think of homeschool transcripts as the place to help their student stand out in a crowd of applicants, college admissions officers may have a different purpose for transcripts. The admissions personnel with whom we spoke look to the application itself to see the individuality of the applicant, while transcripts were strictly used to verify that the base admission criteria for the college or university have been met. Some schools are moving to a SRAR (self-reported academic record) in which the student enters their courses and grades in an online form as part of the college application. If the student is offered admission, a final official transcript is required to verify the self-reported information. In this case, it is important to make sure that the information in the transcript matches the SRAR, but it is also important to realize that the school will not see the transcript until after an offer of admission has been made. The best method is the one that YOU will use, because done is better than perfect. You may even wish to have your student keep the records. No matter which record-keeping method you choose, it is a good idea to save everything your homeschooler is doing from about 8th grade on. Optimally, you will have some kind of written overview of the material covered and activities completed, including keeping the paperwork and any files from each class should you need them (larger projects can be photographed or videoed and filed digitally) as a reference. Beyond that, you can keep records either in a printed homeschool planner, a digital homeschool planner (online service, software, or spreadsheet), or simply keep a notebook with written notes. Delight-directed or interest-led homeschooling does not mean transcripts have to be difficult. Lee Binz used this method to create transcripts for her sons who both received full scholarships to their top choices. Unschoolers can keep track of learning using our unschooling record keeper, included in our printable homeschool planner download. When the time comes to create homeschool high school transcripts, your record-keeping should make it a simple process to enter the needed information (detailed below) into the transcript form/template. It is easiest if you keep up with the courses and grades as you go rather than waiting until you need to submit a transcript to start working on it. While we may think of homeschool transcripts as record-keeping on our part, it’s important to keep in mind that a transcript’s main job is to communicate the student’s readiness for college by proving that they have completed all of the requirements for admission. As such, a homeschool transcript should include course names that are as descriptive as possible and that appropriately reflect the difficulty level of the work. Course descriptions. You may wish to also keep a course description for each course in your personal records (this won’t be needed on the transcript), and you may even want to submit this with the homeschool transcripts. Some colleges find course descriptions helpful; if you decide to include them with your transcript submission, be sure they are no more than one page. Whether or not to include them is an area you may wish to ask for guidance from the admissions office of the school to which your child is applying—giving them more than they want to see can actually be detrimental. Format. Students who have taken longer than usual to complete high school courses may find it beneficial to list courses by subject rather than by grade. The same information is shared but in a way that de-emphasizes the number of years in which the courses were completed. On the other hand, if a student is weak in a specific area it can be de-emphasized by grouping the courses by grade. Outside evidence. You may wish to include information about where your child took specific courses, either on the transcript or a supplemental submission. While colleges accept homeschool transcripts, showing them outside evidence of the student’s work helps colleges to see that a variety of professionals have worked with the student and evaluated their work. Jeanne has written extensively about outside evidence for college admissions, including sources for obtaining outside evidence. Outside evidence may not all fit appropriately on a transcript. Some may be in the application, some may be included as references, and some might be submitted as test scores. Forecasting (during the early planning stages for high school) the content of the student’s final transcripts (and applications as a whole) will help to illuminate gaps that need to be filled. You might find our high school course planner (part of Homeschool Planner Plus) helpful, and Jeanne has written previously about teaching subjects where Mom’s not the expert, which is useful in the planning stages for high school. Social Security number. Some homeschoolers include the student’s social security number on the transcripts, but this is generally not necessary (or even advisable, since it can introduce the possibility of identity theft). You may wish to state “SSN available upon request” if you are concerned that the school might want to see the SSN. An alternative identification is to include the ID number from the student’s Common Application submission on the transcript. In most states, you decide how many credits your student needs to graduate. At the time of this publication, no state requires homeschoolers in the US to follow public school requirements for graduation, but a few states do have graduation requirements for homeschoolers in their homeschool statutes. Be sure to know the homeschool law in your state regarding graduation requirements, if any. Even if you are in a state where you get to decide the number of credits needed for graduation, it can be helpful to know what colleges are seeing on transcripts for the public school students with whom the homeschooled student is competing. You can find the course and credit requirements for graduation for each state and territory in the US on the website of the Education Commission for the States. Homeschoolers should also be aware that their state may have other requirements related to high school that affect college graduation. An example of this is New York’s “preliminary education requirements,” which do not prevent homeschoolers from graduating from high school or enrolling in college, but are required in some form before a student can graduate from college. Since at least one of the options must be completed while the student is still of compulsory school age, it is imperative that homeschoolers know the education laws of their state and of any state where they may wish to attend college. Math starting with Algebra I (or Geometry if your student takes that before Algebra), high school level foreign languages, and high school level sciences are all included no matter when they are taken. Typically, these courses are first taken around 8th grade, but of course this varies by individual. All other courses taken from 9th-12th grade should be included as well. Be sure that your student covers the material that is expected by the institutions to which they will apply. If your student doesn’t yet know what they want to do after high school, it is a good idea to examine the requirements of a variety of institutions so that you can plan for all of the options. Most schools have a page listing the high school requirements (like this one for Virginia Tech) for applicants, but requirements may be different for specific colleges/degree programs within each university. In almost all cases, neither courses nor institutions need to be accredited for a course to be put on a high school transcript. Notable exceptions are if a student is interested in playing NCAA sports (high school programs must be approved by the NCAA), or if a student is planning to go from homeschooling to a public or private high school, which have their own restrictions about what can be transferred in. You can read more about accreditation in our article about homeschool accreditation and in Jeanne’s article about homeschool diplomas. If we covered AP® material, can I list the course as an AP® course? AP® is a registered trademark of the College Board, and a course can only be listed on a homeschool transcript as an AP® course if the instructor and materials “go through a process called the AP Course Audit, which ensures that each AP® course meets specific standards…” and is approved by the College Board as an AP® course for the year in which the audit was done. Homeschool teachers can be approved to teach AP® classes by going through the course audit process before the course is taught. A less restrictive option is to designate a course using AP® material as an honors courses. Honors courses earn that designation through the use of advanced material and homeschoolers should be diligent to use the term only when appropriate. Dual enrollment courses (usually taught at a community college or through a local high school) are another option. Dual enrollment courses are those for which a student earns both high school and college credit at the same time. Typically more weight is given for AP, honors, and DE courses on the transcript, but not always—Lee Binz of The Home Scholar never weights classes on transcripts. And keep in mind that just because a course is designated as DE doesn’t mean that the student will be awarded college credit for it. As with determining the number of credits required for graduation, remember that it is your school, and you decide. If you have any issues, you may wish to offer a notarized copy of the transcripts, although this should not be necessary. 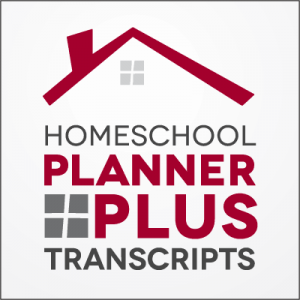 Homeschool Planner Plus includes an older version of our transcript template, but we have revised and updated the transcript and are making it available as a separate download. The revised and separate homeschool transcript workbook for Excel has options for creating a transcript either by year or by subject, and includes both 10 point scale and 10 point scale with +/- options. For questions, see the help Q&A. At this time, we are only offering the updated homeschool transcript template for Excel and not other spreadsheet programs. Simply choose the style you prefer and enter the courses with the grades. For courses that should be weighted (honors courses, for example), simply add the extra weight in the indicated column and it will be figured into the final GPA. The spreadsheet is locked to avoid changes that might affect the GPA and credit calculations. If you are experienced with Excel and wish to unlock the tabs, you can do so with the password letmein. Each tab must be unlocked separately. I highly recommend checking the calculations manually after making any changes to ensure that they are correct. Do you have questions about transcripts? Let us know in the comments. My son is in 11th grade. He goes to the High School for a weights class only so that he can play baseball for the school. The state athletic committee is now asking for a transcript of 1st semester and also the current home school classes he is taking.Is there a way that you can do like a report card with both semester on them? If you are using our transcript template, complete it as you normally would for previous years. For the current year, only list what he has taken the first semester (showing it as a half credit). I would submit the list of current classes separately, since transcripts are only for classes completed. What about if your state (GA) does NOT require you to meet the standard graduation requirements as public school? what do you recommend as important on a transcript for a student who is not college-bound but will be joining the military? also, what if he was college-bound? i assume if he was college bound the GPA would be the most important thing to include? Thanks. I haven’t kept up with what the military looks for specifically in a homeschool transcript but if you have concerns, a military recruiter would be a good person to ask. For a child who is college bound, please see the sections above on “How many high school credits are needed to graduate?” and “Which courses should be included on a homeschool transcript?” There is no one right answer, and just like for public school students, there are many paths that homeschool students can take to get to college. Jeanne’s article about Outside Evidence (linked above under “Other homeschool transcript considerations”) goes into detail about what colleges might look for in applications and transcripts from homeschooled students. I hope this helps. I have a fairly unusual situation. I’m the student! My homeschooling process was very nontraditional and there’s no real record of what I did. I studied all of the required course materials, including taking courses in mathematics through the HS level. Here’s the thing: I tested at 12 grade level at about 12 years old, and I didn’t really do anything after that until I turned 16. I applied to a local community college at that time and became a full time student there. Some time afterwards, I called my state dep. for a HS diploma because I realized I didn’t have one. After verbally confirming what I did they issued a diploma, but it was dated 2 years /after/ I started full-time college. How do I write out a transcript that reflects when I actually finished my coursework, but also accounts for when the diploma was issued? The credits I took at the college for those two years weren’t dual enrollment credits, since that’s a separate admissions process. They didn’t require a diploma when I applied, just a placement test which I obviously ‘passed’. If I write them as dual enrollment, it’d be lying and they likely wouldn’t transfer for credit and I’d waste a large amount of money on the two years of undergrad I did while ‘not graduated from HS’. Any advice? I’m really stumped now at age 20, because colleges I want to transfer to require HS transcripts and my mother and I don’t have a clue. The colleges you want to transfer to require transcripts, but they may not require a diploma. Most colleges do not ask to see a diploma; they do ask for a high school transcript. There may be an exception for some colleges in a few states, so look at the websites of colleges you want to transfer to. I just looked at the guidelines for admission of homeschool students for a handful of colleges, and not one asks for their prospective students to submit a diploma. All ask for transcripts. It is possible that what you assume they want will not be necessary. I’ve never been asked for my high school diploma and neither were my sons, including those who are now college grads. All of us have been asked for our transcripts. Community college classes are a benefit to transferring students whether they were taken as dual enrollment or as a full-time admitted student. Assuming you made decent grades, your community college credits will make you more attractive to four-year colleges. You can ask the community college to send transcripts to the colleges you want to transfer to. They show you are prepared to do college level work. Most colleges will put more weight on your community college record than your high school record. You and your mom could make a transcript to reflect what you learned up to the point of your enrollment in community college. Homeschooling in a nontraditional way does not preclude you from having credit for your learning. Create a transcript with credits that reflect that learning. For example, if you passed the placement tests at community college, you may decide to put down credits for English 9, English 10, English 11, and English 12. Another way to do it would be to name what you actually did. For example, if you read a lot including some classics during those years, there may be a credit for American and Popular Literature; if you knew how to write and practiced good writing skills on your job or in projects, there may be a credit in Writing Mechanics, etc. Even if nontraditional, you learned or knew transcript-worthy content and skills. Your learning did not have to have been arranged in “courses” to count. You do not have to feel covert about this. If someone asks how you homeschooled, explain how it was nontraditional and experiential, and you still managed to excel at placement tests and community college courses! High school transcripts do require a date of graduation. I would put the year of graduation on your transcript that you mom and you consider you to have graduated from homeschooling. Quite a few homeschoolers do graduate at 16 and enroll full-time in community college. If you look into what documents are required and determine that you will not need to submit a high school diploma, there won’t be a discrepancy. The problem is the error in the date on the high school diploma, but that doesn’t need to lead you to lie on transcripts to make dates agree. Your date of high school graduation is the one on the transcript you and your mom will make. Go out for coffee, take your old calendars, and make lots of notes about the things you did, so you can create your transcript. Yes, it’s easier to do it in “real time,” but you are not the first person who has had to re-create a record of nontraditional high school learning. Hi, do you have any suggestions on how I should write courses that I took in eighth grade? HI Sarah – It’s best to only include the high school level courses you took in 8th grade (math & foreign language, usually). You would just set the first year for the 8th grade year and write those courses in just like you would your high school courses. In my daughter’s transcripts, there are only two courses listed for 8th grade. Thank you for offering this transcript form to us. It is most helpful. I would like to add more rows to a few years on the spreadsheets, could you give us the password to “unprotect” the sheets? Hi LalaV – Thanks for asking about that. I provided the password on the page with the overall planner (of which this was originally a part) but I forgot to include it here. The password is letmein . Just right click the tab you want to unlock and enter the password. Each tab has to be unlocked separately. I have a site that teaches Ap courses that are approved by CollegeBoard as an actual Ap Class. They even offer paid certificates to prove you took that course if you wanted to by choice. Would I be able to list it as Ap on my transcript then? And I think my best bet is to pay the certificate for extra safety. Typically, as long as the College Board has approved the course for the term it was taken and your student completed all of the coursework required, you can list it on the transcripts as an AP course. Usually a certificate would not be necessary but without knowing the specifics of the organization through whom the course was taken, I can’t speak to whether that is needed. Hello! To whom it may concern. I became a subscriber and its not allowing me to download the free homeschool transcript template. Hi Gina – Please try downloading the transcript template with this link. I can’t replicate this problem – are you trying to download it on a desktop computer? What exactly happens when you click the link? I click the link and get a dialogue box asking if I want to save the file or open it. I click my choice and it downloads the file to my downloads folder (and if I have selected open, it opens it with Excel). There is no need to be a subscriber to download the file – no login is necessary.